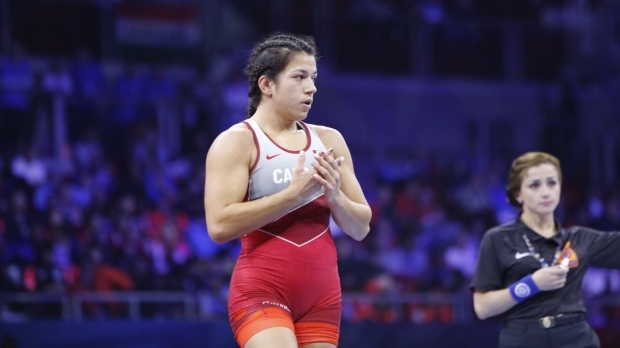 BUDAPEST, Hungary -- Canada's Justina Di Stasio won the women's 72-kilogram title at the world wrestling championships on Wednesday with a 4-2 win over Mongolia's Nasanburmaa Ochirbat. Di Stasio, from Burnaby, B.C., scored two early takedowns to move in front 4-0. Ochirbat scored a takedown to close the gap, but Di Stasio defended successfully for the remainder of the match to pick up the win. Di Stasio's gold was one of three for Canada on the day. Danielle Lappage of Olds, Alta., earned silver after a controversial 6-5 loss to Finland's Petra Olli in the women's 65-kilogram final. And 2016 Olympic champion Erica Wiebe of Stittsville, Ont., defeated Epp Mae of Estonia to claim bronze in the women's 76-kilogram event.